THE countdown has begun for the last months of President Benigno Aquino III. Activists from the LGBT (lesbian, gay, bisexual and transgender) community hold out little hope that the Aquino administration will address their grievances in its final months after it failed to respond to their needs in its earlier years. Murphy Red, chairperson of Kapederasyon LGBT Sectoral Organization, lamented the fact that unlike other marginalized sectors that receive support from local government units or the social welfare department, not one agency caters to the needs of the LGBT community. “Ang ibang mga marginalized sectors ay, kahit papaano, may mga institution sa pamahalaan na nag-ca-cater sa kanilang mga interest, tulad ng iba’t-ibang programa ng mga LGUs at ng DSWD. Pero sa mga LGBT, wala talagang institution na nasa gobyerno ang nangangalaga,” he said. 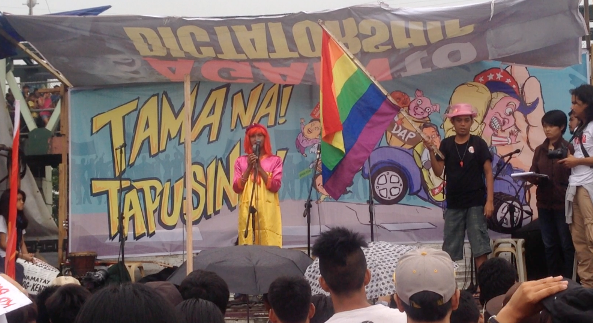 The LGBTs joined other protesters to express disappointment at the Aquino government when the president delivered his last State of the Nation (SONA) address last Monday, July 27. They braved the rains as they marched along the stretch of Commonwealth Avenue. “Nakalimang SONA na siya, pero ni minsan hindi niya binanggit ang mga LGBT. Wala sa agenda niya ang kalagayan ng mga LGBT,” Red stated. 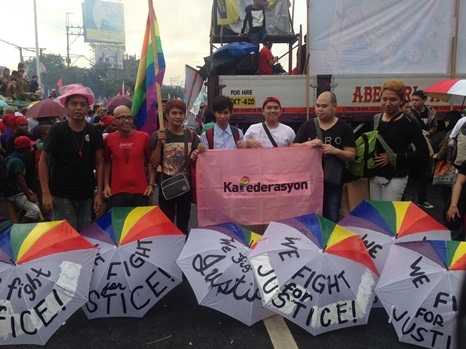 Aside from the lack of support programs for LGBTs, Kapederasyon also regrets that Aquino has not backed the passage of the Anti-Discrimination Bill that would safeguard the rights and security of the community, saying it is not a priority of the government. “Hindi priority ng rehimen na ito iyong pagpasa ng Anti-Discrimination Bill, para mapangalagaan iyong mga karapatan ng mga LGBT at iyong seguridad ng mga LGBT na nagreresulta sa sunod-sunod na pagpatay,” Red pointed out. The Anti-Discrimination Bill, if passed, will enforce fines and jail time to anyone who commits discriminatory acts against LGBTs. Some of the prohibited acts in the bill include the denial of access to public and military services; refusal of admission or expulsion from educational institutions; denial of access to medical and other health services; denial of access or use of establishments, utilities, or services including housing that are open to the general – all of which, on the basis of sexual orientation and gender identity. Contrary to government pronouncements that the LGBT sector is part of state’s gender advocacy, in reality, their needs and concerns are not being addressed, Red added. As Aquino’s term comes to an end, Kapederasyon calls for the inclusion of LGBT issues in the platforms of the 2016 presidential candidates. “Sa mga tatakbo sa 2016, para masiguro nila na makukuha nila ang boto ng mga LGBT, kailangan may malinaw silang agendang ilalatag para sa kagalingan ng mga LGBT,” Red concluded. 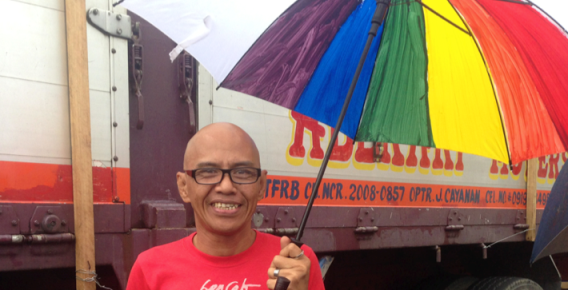 « Did PNoy leave LGBT Pinoys in a ditch?